NIDA’s Web site (www.drugabuse.gov) provides information on all aspects of drug abuse, particularly the effects of drugs on the brain and body, prevention of drug use among children and adolescents, the latest research on treatment for addiction, and statistics on the extent of drug abuse in the United States. 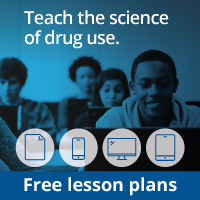 The Web site allows visitors to print or order publications, public service announcements, posters, science education materials, research reports and fact sheets on specific drugs or classes of drugs, and the NIDA NOTES newsletter. The site also links to related Web sites in the public and private sector.